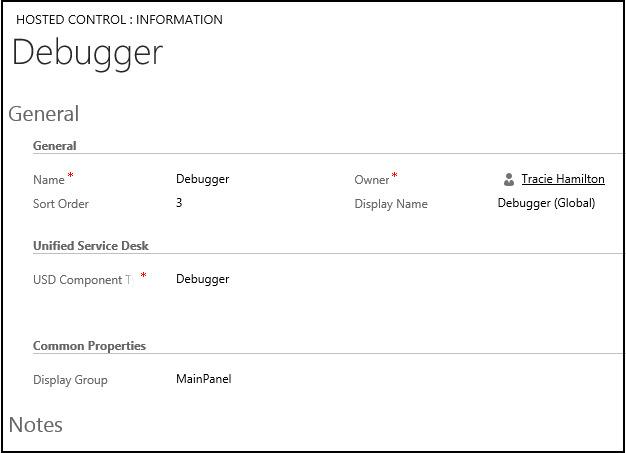 Use Debugger hosted control type in Unified Service Desk to configure a debugger control in Unified Service Desk to provide you with insights about the process and code executions in the agent application. All the three sample applications in Unified Service Desk come with a preconfigured Debugger hosted control. For more information, see Debug issues in Unified Service Desk in the Unified Service Desk Administration Guide. While creating a new hosted control, the fields in the New Hosted Control screen vary based on the type of hosted control you want to create. This section provides information about the specific fields that are unique to the Debugger hosted control type. For detailed information about creating a hosted control, see Create or edit a hosted control. Under Unified Service Desk area, select Debugger from the USD Component Type drop-down list. The Display Group field displays the panel where this hosted control will be displayed. MainPanel is the most common for this hosted control type. For information about various panels available in Unified Service Desk, see Panels, panel types, and panel layouts in Unified Service Desk. For information about other General fields, see Create or edit a hosted control. Name of the user-defined event. Name of the hosted control to be moved. Target panel for the hosted control. Creates a page for creating a new Dynamics 365 record of the entity specified, and treats the page as a popup from the specified hosted control. The window navigation rules are evaluated to determine the location where the page to create the entity record is displayed. The logical name of the entity for creating a new instance. The logical name of the entity to open. The ID of the entity record to open. Routes a popup from this hosted control using this URL as if it were a popup requested from the displayed control. The frame from which this popup originated. Specifies the screen on which to display the hosted control. Valid values are 1 or 2. If you don’t specify this parameter, 1 is passed by default. Specifies the position, in percentage, from the left of the screen on the target monitor where the hosted control should be displayed. Valid values are 0 through 100. If you don’t specify this parameter, 0 is passed by default. Specifies the position, in percentage, from the top of the screen on the target monitor where the hosted control should be displayed. Valid values are 0 through 100. If you don’t specify this parameter, 0 is passed by default. Specifies the width, in percentage, of the hosted control window on the target monitor. Valid values are 1 through 100. If you don’t specify this parameter, 100 is passed by default. Specifies the height, in percentage, of the hosted control window on the target monitor. Valid values are 1 through 100. If you don’t specify this parameter, 100 is passed by default. The width of the hosted control. The height of the hosted control. Sets an arbitrary replacement parameter value to a specified value. The hosted control name or key field for the replacement parameter. The replacement parameter sub key name. Set this to true to set the value in the global session. Set this to false to set the value in the active session.